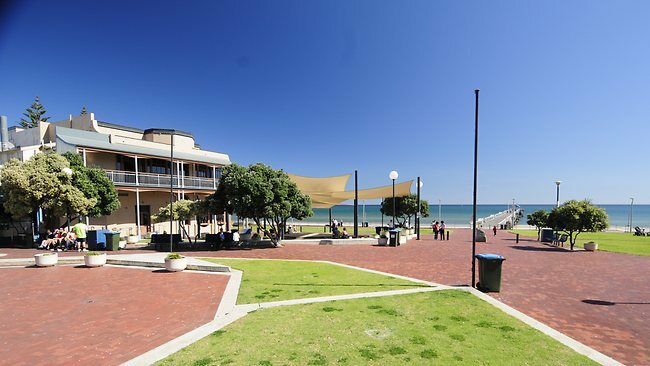 After spending an afternoon at Henley Beach taking in the glorious summer weather we're fortunate to have in Adelaide, my friend and I decided to take a stroll to Henley Square for an early dinner. 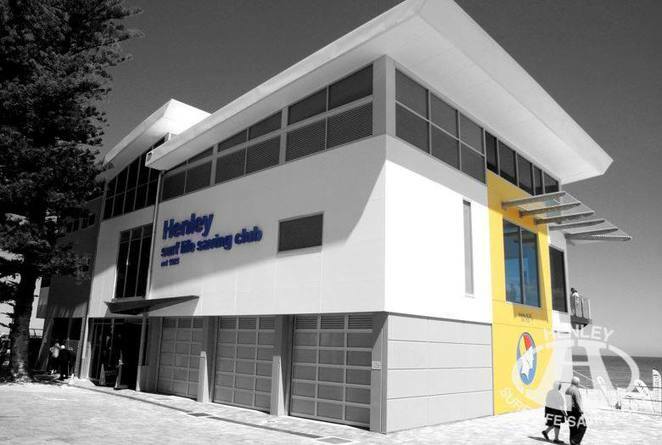 As we walked towards the square I noticed the newly built Henley Surf Life Saving Club was open. Curiosity got the better of me, and assuming it was only open to members, I wanted to take a closer look. Luck was on my side, because and as I approached the front doors, a sign read it was open to the public. What a perfect place to have dinner! After walking up a flight of stairs, I was in the restaurant area, complete with its open plan design, and big windows offering panoramic views of the ocean. Pick your spot and there's a window with a view! As it was a gorgeous evening, we sat on an outside table on the balcony, astounded at how we had by chance found the best view in Henley Beach to dine at - it was breathtaking. I walked to the bar and introduced myself to manager David, who handed me the Oceanview Bar and Restaurant menu. Not only was the view spectacular, but friendly service with a smile made all the difference. 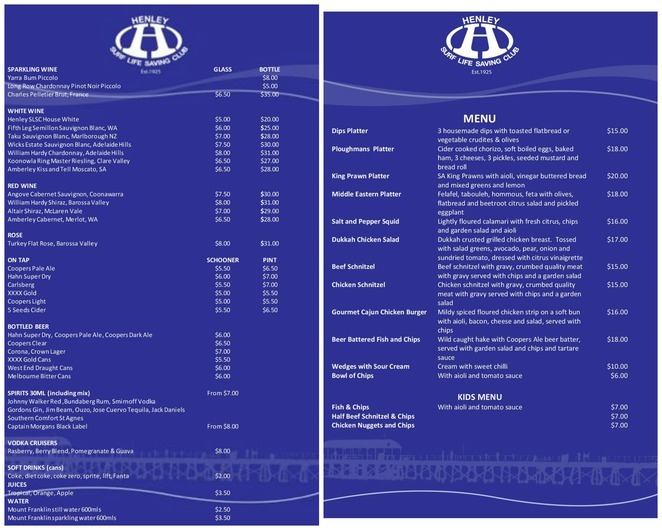 The menu had a range of choices, and the prices were very reasonable. I ordered two platters - one Mediterranean and the other prawn, accompanied by a bottle of Sauvignon Blanc. 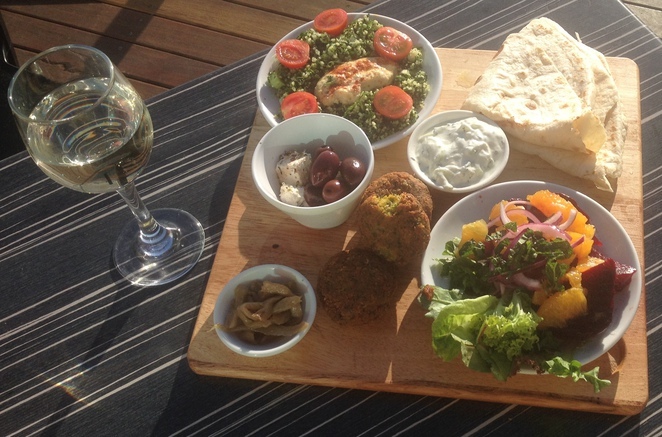 Somehow wine, platters and a view accompany each other extremely well. 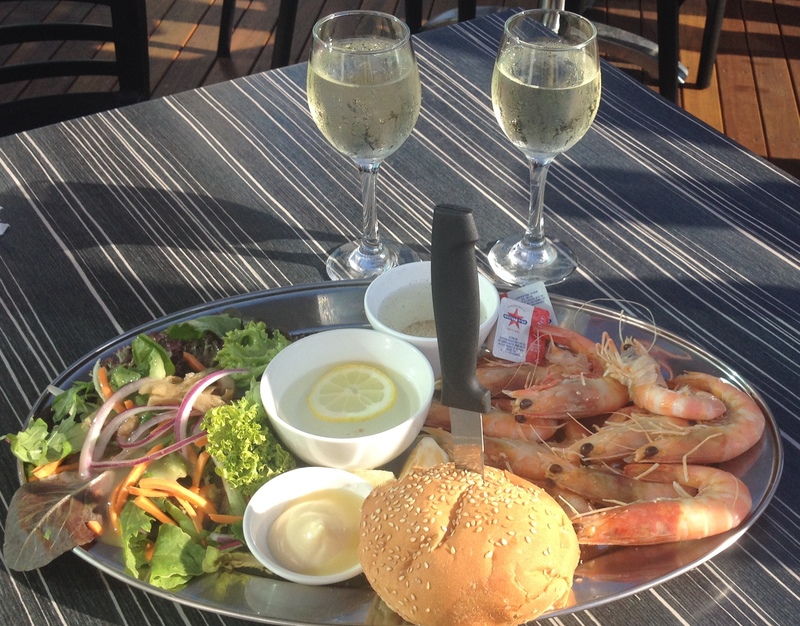 Prawn platter, perfect for summer with a glass of Sauvignon Blanc - delicious! People of all ages started to fill the room, placing orders for dinner and chatting amongst themselves on the outdoor balcony. What a perfect vantage point to watch the sunset, and take in the ocean breeze - everybody was in happy spirits and the floor staff were working overtime delivering orders to inside and outside tables. What made this place even more special is that even with the place buzzing and busy with people, our order arrived within five minutes. This is a Surf Life Saving Club right? You betcha it is - and there's a history behind it too. Henley Surf Life Saving Club was the first of its kind on on the beach in Adelaide, originally under the Royal Life Saving Society. The club was the first to be accepted into the Surf Life Saving movement in 1953. The club originally formed after a meeting of local residents and council members in Henley Town Hall on the 1st of October, 1925. View from the inside of the dining area. Views everywhere! To date there's around 706 registered members ranging from 7 years old to Jim Doherty who's 95, and still officiates at inter club and interstate competitions. Now that's what I call dedication! The club was without a building for 18 months during the demolition and construction stages. They continued to operate out of shipping containers in the carpark, with gear stored in an old service station closeby. So dedicated are the members, that even though there were no shower facilities after their time on duty during the construction phase, the club's membership grew. The restaurant is open Friday nights, Saturdays and Sundays. On the weekends there's a buffet breakfast and all day meals. Check the website for opening hours as they do open sometimes on public holidays. I think I've found my new hangout for summer. I would've liked to have kept it a secret, but that's impossible. I hope you enjoy it as much as I did. Tip: If you contact Nick through Facebook you will get a quick reply. Now that's all round service! That looks absolutely brilliant! I've added it to my To Do list and I'll be sure to visit there soon! Thank you for the detailed review with such good photos.Will definitely visit there soon! Surf clubs are a great option. 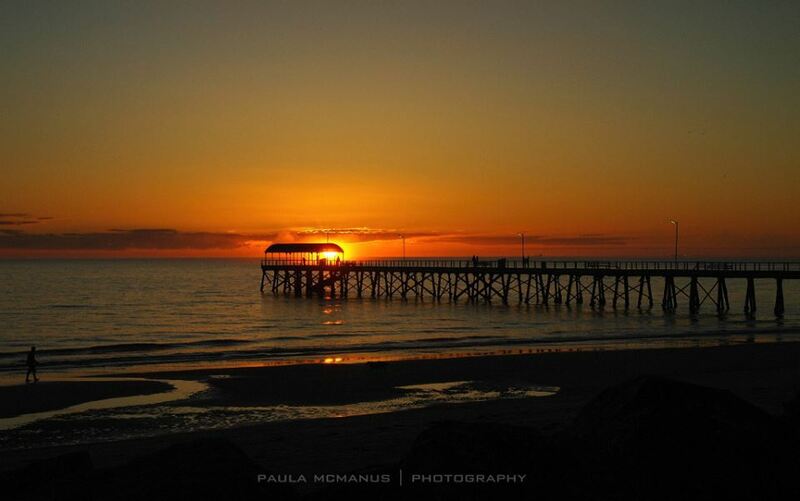 Glenelg also offers good food at a good price. Great article, very comprehensive. 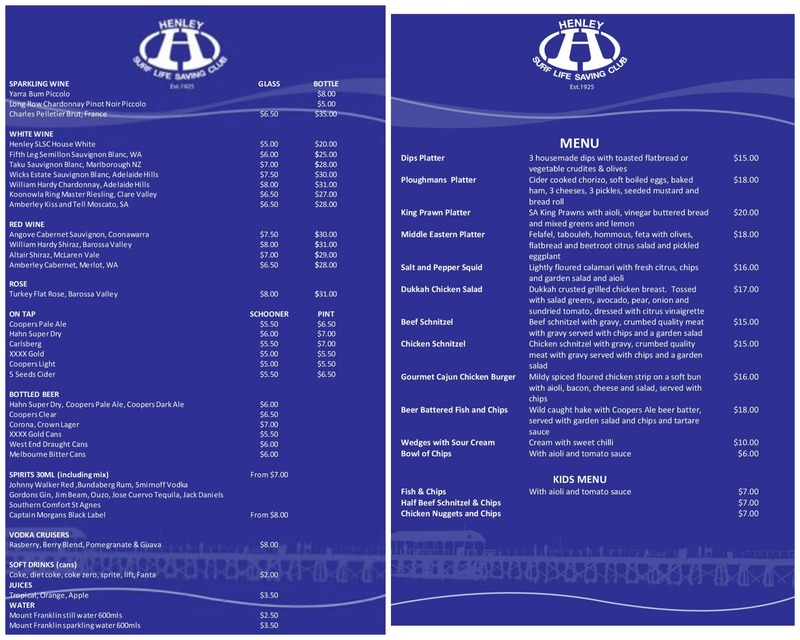 Nice photographs and the inclusion of the menu is great. Definitely a place to visit in the future, thanks for sharing!